Lately, Felicity just can't shake a shadow of uncertainty. Her husband Quinn is the kindest person she knows and loves her peculiarities more than Felicity feels she deserves. But suddenly it's as if she doesn't quite belong. 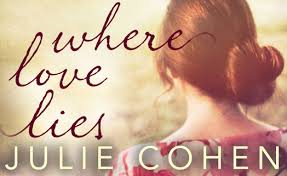 Julie recommended that I try Where Love Lies as it's an easier, lighter read than Dear Thing. So, when I was approved on Netgalley, I was eager to get started. Julie lied... This is not really a light read. It's so much more than that! It's so powerful, emotional, beautiful and brilliant. Felicity is such an amazingly strong character. I instantly loved her and as her story unfolds, I grew to lover her even more. I know her heart ache. I've been there and it was so similar for me. I love how Julie gets inside my head (or so it seems) with this book. Quinn is the loveliest man, but I understand Fliss' doubts and worries. I think many women have them. She is so relatable and real. I can't say that enough, she's real and warm and just fantastic. There are some amazing twists in this fabulous story. Ewan being one of them. Bless him... I cried for him too. Ugh, this book!!! It's just so emotional!! The outcome is one that I pictured and I feel I left all the characters right where they needed to be. You know how with some books, you hate where it ended and you need to know more? Not this one. It finished where it should have. Perfect. Julie, you are too good. You just get people and emotions too perfectly in your writing and it's so hard but so rewarding to read! You're an absolute gem of an author! 10/10 for this brilliant book! I received a digital copy from Netgalley in exchange for my honest review.